This was a lot of work for very mediocre results. This is a go-to easy recipe that can be prepped in 15 minutes. I use Bullseye BBQ sauce and use about double the brown sugar that the recipe calls for. You can vary how your brisket tastes by using the different flavors of Bullseye (Texas, Original, Memphis, Sweet and Tangy, Carolina). This is a really nice slow cooker recipe. If I was going to be at home, I would make the conventional version, but when I'm out of the house in the evening, this is great to come home to. Bacon added as garnish at the end is a nice change from bacon cooked into the dish. Pg. 277. This is fine, but nothing extraordinary. Easy to prepare, but takes quite a long time in the oven. I did a light version of this. Steamed brussel sprouts, dressed with olive oil and fried pancetta. Even the brussel sprout-hater Andrea liked it. There is something magical that happens with certain foods when you slow down the cooking: flavors deepen and become more complex, meat turns meltingly tender, and fruits and vegetables develop a rich, caramelized exterior. With The Slow & Easy Recipes, the cooks at America's Test kitchen have taken a fresh approach to the classic techniques of slow cooking to give you uncomplicated recipes that are worth the wait. Whether you're looking for the definitive version of familiar favorites (Classic Beef Stew or Pot Roast with Root Vegetables) or something new to add to your repertoire (Cuban-Style Roast Pork or Lamb Tagine), you'll find it all here. Find out why cooking a roast at an unusually low temperature gives you the most tender, flavorful meat ever and learn one of the easiest, most foolproof ways to cook fish (in a large covered pot). We'll tell you why cooking side dishes in the oven (rather than on the stove) gives you the most consistent, reliable results every time and how a moderate oven temperature and extended cooking time can make the most of out-of-season fruits and vegetables, creating new and unexpected flavors. 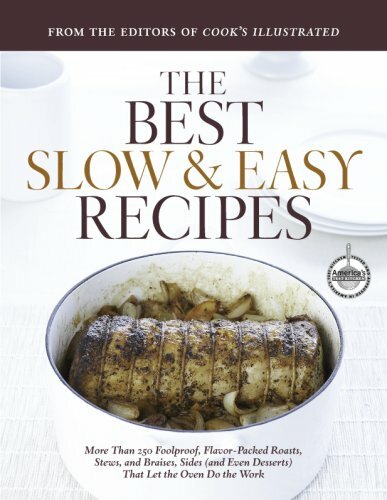 With The Best Slow & Easy Recipes in hand, you'll discover that sometimes slower is simply better and easier.